In 1938, Marjorie Courtenay-Latimer, the curator of the East London Museum in East London, South Africa, was informed that a pale mauve-blue fish, five feet long, had been netted by a trawler in the Indian Ocean off the coast of South Africa. Unable to identify the fish, she contacted her friend J. L. B. Smith, a professor with interests in ichthyology and chemistry at Rhodes University. By the time Smith returned from leave, the fish had been stuffed, but he immediately identified it as a coelacanth, long-thought to be extinct for 65 million years. There were once ninety species of coelacanth, but there are now only two. 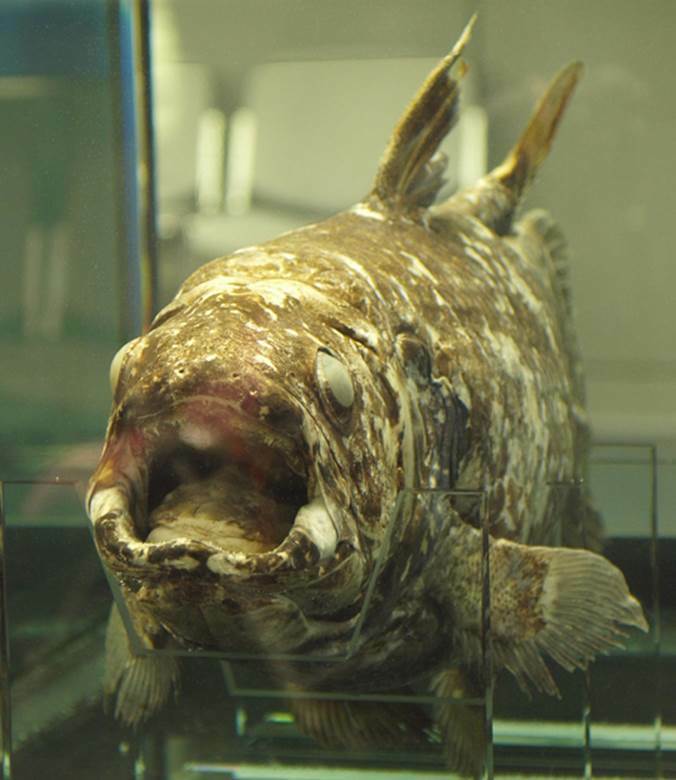 Coelacanths are classified as being the most endangered order of animals in the world and are designated by the genus of Latimeria, in honor of the museum curator. The coelacanth is not just another old fish but rather a lobe-finned fish more closely related to lungfish, reptiles, and mammals than it is to common ray-finned fish so familiar to us. It is the link between fish and the tetrapods, the first land vertebrate to inhabit the earth, with the two groups diverging some 400 million years ago. The coelacanth is referred to as a “living fossil,” as it apparently has not evolved over the millions of years when it made its debut appearance. Since 1938, about 200 deep-blue coelacanths have been caught in the Indian Ocean, most near Comoro, an island-nation between Mozambique and Madagascar. Brown coelacanths have been caught in the waters off Indonesia. They are up to 6.5 feet (2 meters) in length, have an average weight of about 175 pounds (80 kilograms), and a lifespan of 80 to 100 years. Coelacanths have paired lobed fins used for swimming or walking that extend away from the body and move in an alternating pattern, resembling a trotting horse. The hinged joint in the skull permits the fish to widen its mouth to accommodate large prey, their scales are thick—a characteristic only found in extinct fish—and they have a notocord, which serves as a backbone. SEE ALSO: Fish (c. 530 Million BCE), Fossil Record and Evolution (1836). A model of the Indonesian coelacanth (Latimeria menadoensis) is on display at the Tokyo Sea Life Park.